I wrote in my last blog about my recent trip to Bratislava, Slovak Republic for Hyperloop Transport Technologies’ (HTT) very first Digital Innovation Challenge. The Hyperloop, essentially a super speed train, promises to revolutionize transportation as people ride capsules in vacuum tubes traveling at 760 miles per hour, fast enough to enable someone living in New York City to commute to Washington D.C. for work in just 30 minutes. The Hackathon challenged teams of app developers to create an app to improve the Hyperloop travel experience. Previously, I looked at a number of potential innovations they could have built, including the last mile (how to get travelers to the nearest Hyperloop station), ridesharing, subsidized rides, and alternate funding (to reduce the cost to the traveler). For the challenge, teams were given eight hours to develop an app that could be integrated into the existing Hyperloop app ecosystem, which will act like an app store for traveling and commuting. The contest was run by Hyperloop Transportation Technologies and sponsored by several of the world’s most innovative high-technology companies—Catalysts, Anext, DB, d.lab, IBM, Lufthansa Innovation Hub, Campus Party, and Towercom. I was one of the judges along with Christian Federspiel, CEO of Catalysts. Our selections were based on the innovation potential and feasibility of a particular team’s idea, as well as the effectiveness of its pitch and presentation. The winning team, ST Digital, was local to Bratislava and consisted of a businessman, marketing expert, graphic designer, and a web developer who worked together to tackle the last mile challenge. The team said since the Hyperloop will be extremely important to the local communities with stations, local businesses would be willing to compete for their customers. Their app for the Hyperloop market would conduct a bidding war among different transportation options. ST Digital won the top prize—round-trip tickets to visit the Hyperloop Design Center in Los Angeles. I was a bit hesitant on whether we would be in position to demand bids from all the local transportation options when we first started working on the hyperloop, but we could build toward this goal. The second place winners, Team MeshMe from Vienna, Austria, consisting of two engineers, one marketer, and a business leader, earned the opportunity to work on their project for two weeks in Paris as Hyperloop Summer Invitation Fellows. They worked on a way to help travelers relax and mitigate traveled-related stress using ambient lighting, soothing music, and the reading of a short story geared to the traveler’s desired mood or literary preferences. If the app found that a sufficiently large number of travelers have similar/overlapping profiles, it could schedule them to all travel in the same Hyperloop pod and then set the pod’s sound and lighting controls to accommodate the group’s shared tastes. This is something that a train or plane cannot do. Third prize, dinner with Hyperloop Transportation Technologies CEO Dirk Ahlborn, went to a local app developer, Peter Ralbovsky, who created a prototype mapping system for travel to Hyperloop stations using the demonstration data that the contest provided to all participants. The Hackathon also featured a keynote address by the man largely credited with creating the home video game industry, Nolan Bushnell. I spoke on how the Hackathon was part of our effort to make travel more of an event through apps on the Digital Experience. 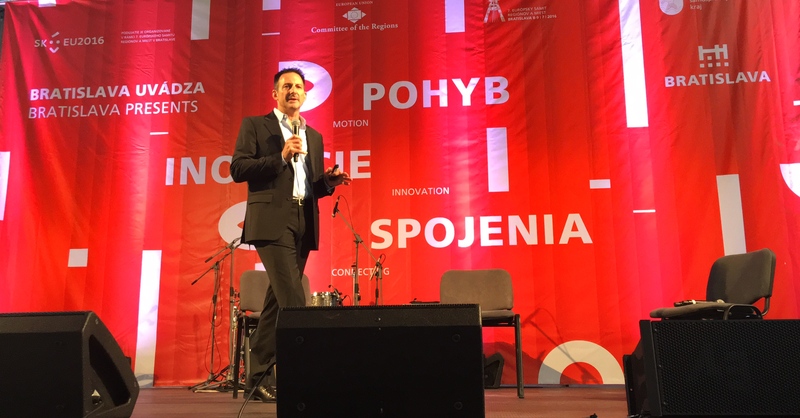 We also heard from Miroslav Lajčák, the Deputy Prime Minister of Slovakia as well as Dirk Ahlborn and his business partner, Hyperloop Transportation Technologies Chief Operating Officer, Bibop G. Gresta. The Hackathon was a great vehicle for introducing the Hyperloop app development process to creative and innovative talent from all over. I predict many more companies, in a wide variety of industries, will hold similar open contests in the future, which will effectively do away with the need for companies keeping everything secret and proprietary. That way, companies benefit from outside ideas and talented people whose different experiences allow them to see solutions their own employees may miss. The Hyperloop Hackathon was a full on demonstration of the groundbreaking, potentially paradigm-shifting nature of the Hyperloop. Indeed, the project extends beyond cutting edge technology to encompass outside-the-box thinking, introducing even more innovation to this 21st-century transportation system. I hope that all the participants continue to refine their ideas. Someday soon, I expect to use the mapping system to plot my course and the bidding service to find me a low-cost ride to the L.A. Hyperloop terminal where I can look forward to having my traveling stress eased via soft lighting and the upbeat strains of Metallica.